Is it just me or has the world gone mad?? We received 2 quotes so far for demolition and we have been shocked to say the least. We have a single storey double brick house with a detached garage. We are expecting quotes around the $12k-15k mark. This is from speaking with a few of our friends who have done demolition recently. Can anyone share how much their demolition costed? Thanks! Ours was a single storey 3bedroom brick veneer house and costed about $17.6k this also included demolishing the pool and some retaining walls. Yours probably will cost a bit more as it is double brick (a lot more work for demolition). Do you have any other structures? We do have 1 carport and 1 pergola in the back yard and that's pretty much it. We paid 22k.... i think it was excessive. We got our initial quote and it was just under $16k in Sep 14, however the NSW increased the levy on disposing building waste (true got a copy of the formal letter the demo company got) and as a result cost went up by $1.8k . Orph do you have any asbestos? That would contribute to the cost as well. Yeah I told them possible asbestos in garage and outdoor dunny but that's pretty much it. Probably explains the high quotes. I read a few builds had to fork out an additional $3-$5k when the demo company found asbestos. I just got a call from M and our assigned CSC is Christine. I think she is the CSC for some of you too? Anyway I was told I need to engage a PCA for the CDC approval or was it for the construction certificate? Is this correct? I though M was managing the whole CDC application? Or is the CSC referring to the PCA in the construction phase? 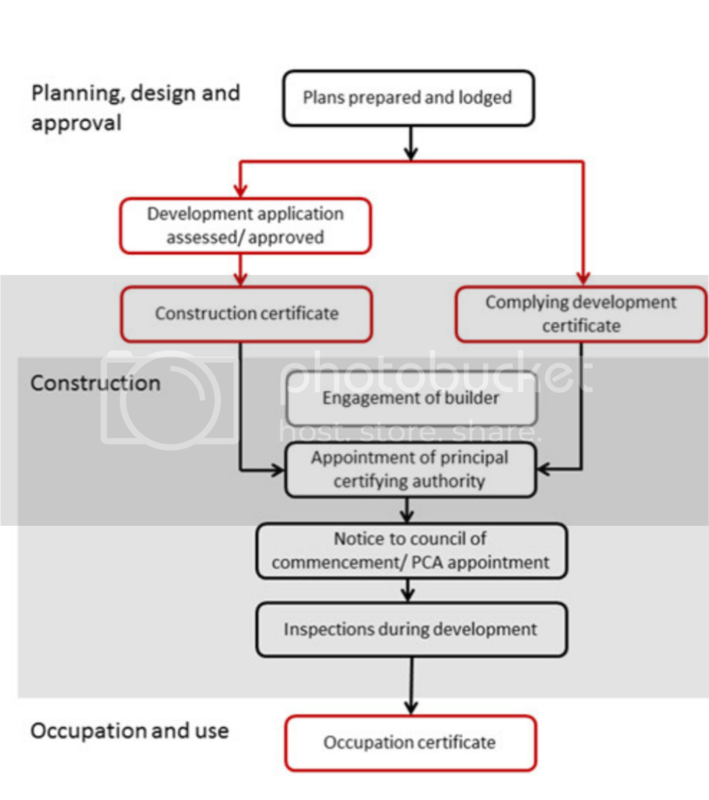 Apparently the PCA will complete inspections throughout the course of construction and certify that works are progressing in accordance with the building code of Australia. Does this mean we don't need another independent inspector anymore (eg HouseInspect )? Hi Orph. I cant answer in regards to if M should organise the PCA or not, only your second query in relation to independent inspector. So we need to engage a PCA before or after CDC submission? From memory PCA costs around $900? We have gone CDC... and we weren't asked to do this =/ I know Local go do their own inspections as part of the CDC. We have gone with H0ward Ry@n - he only does two inspections, and told us that slab inspection is unnecessary as only a structural engineer would know if it has issues - so he said all the additional inspections were a waste of $$$. I think with H0uspect, it depends who you get - as it depends on their subcontractor in the area. With HR, him or his son do the inspection. Yes I think they deal directly with M.... I know recently when we got in touch re our landscape plan, they had advised our file was with one of their staff, who had an appointment on site to do the frame inspection. So Mona you didn't have to engage a PCA?